I'm hoping no one gets ticked for me putting in a plug for a vendor and this memo will confirm I have NO financial interest in doing this, but I had to show the group a photo of one of a set of 4 of these wheels. I bought these refurbished wheels from Collision Wheel in Bath, PA.
HOLY S**T they are nice! Correct silver sparkle with the milled edge. They look even better than the photo below shows, now I'm afraid they are so good they are going to make my car look like c rap. I'll take that chance though. I am 100% satisfied, as far as being correctly finished, these folks NAILED IT. I sat one next to one of the wheels currently on my car and now I don't even want to look at my existing rims anymore, bring on the swap! They look great! 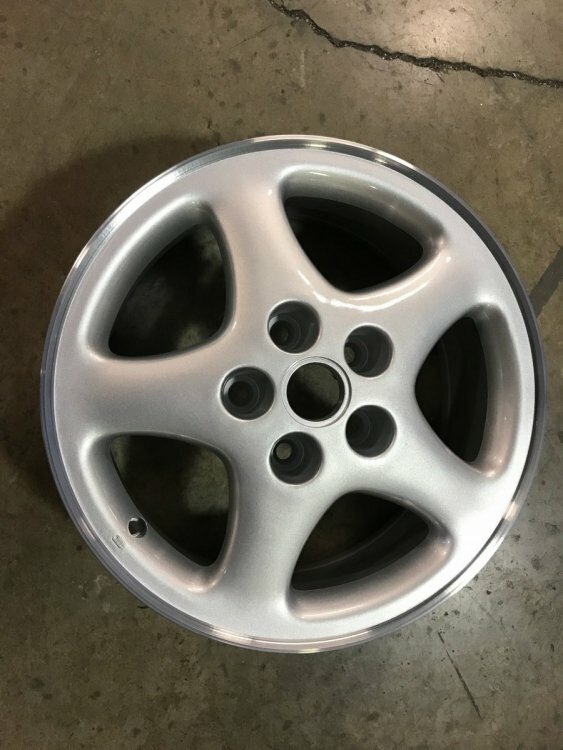 I'm worried about the finishing results of my CS pie alloys, I hope someone can replicate the Oldsmobile lettering and correct shade of tint. Heck if anyone can do it I'd wager they can. I'm now thinking about having them refurbish a set of wheels I have for my 79 Hurst Olds. It takes real talent to get that job done right, especially the centers which are a true pain in the A** to get done correctly. There's nothing wrong with sharing a good source. That place did a really nice job. It's when people join just to post ads that there's a problem. I love those Cutty 5-spokes! My dad used to have a white '96 Cutlass and painted the 5-spokes matching white and got the windows tinted 50% (legal limit in Minnesota) and that car is one of my favorites that he's had throughout the years. He also had a '91 Grand Prix GTP in the mid-90's and also bought a brand new 1999 Grand Prix GT sedan and brand new 2001 Monte Carlo SS with the ground effects package. He was a W-body fan back in the day. the milled edges look nice. Can't wait till next year! I've dumped A TON of money into this white 1996 CS since I got it and in retrospect it's all been worth it, I'm really enjoying driving it every day to work. To think at one time these cars ruled the road but these days they just aren't around. Next year- Cross Drilled slotted rotor and ceramic shoes to add some stopping power. I'll probably go with E-Line or Power Stop. And I've GOT to get that leak into the trunk fixed, it's driving me NUTS! Looks great. Did they redo the center cap as well? My experience having my wheels like that refinished is the paint they use isn't nearly as durable as the factory finish and is much easier to damage. Some refinishes are better at it than others.